Two of the biggest problems for the Dallas Stars last season were defense and penalty killing. This season, they're a big part of the team's rise to the top of the Pacific Division. And the biggest reason for those rising numbers has been the change in net, with goaltender Kari Lehtonen providing a consistently strong presence each game. The Stars gambled on acquiring Lehtonen late last season, and the move certainly has paid off so far this season. Last season, the Stars' were 23rd in the League in goals-against per game (2.98) and 27th in penalty killing (77.4 percent). Entering Thursday's games, however, they're 11th in team GAA (2.65) this season. And while they're still 27th in penalty killing at 78.4 percent, it's been huge for them recently -- the Stars haven't allowed a power-play goal in their last five games and have let in just two in their last seven. There's a direct correlation to those results and the Stars recent run of success -- they've won four straight and six of their last eight. Leading the way has been Lehtonen, who is playing as well as he did in 2007, when he helped the Atlanta Thrashers make the playoffs. The 27-year-old Helsinki native is third in the League with 12 wins, and has a 2.61 GAA and .914 save percentage. He's also played 20 of the Stars' 23 games, which shows the back problems that plagued him in Atlanta and made his acquisition a questionable one in Dallas have not been an issue. The most games Lehtonen has played in a season is 68, in 2006-07. Last season, he didn't play until he arrived in Dallas due to offseason back surgery. He played just 12 games, going 6-4-0. This season, however, he's on pace to play 71. Coach Marc Crawford, however, isn't worried about wearing down his workhorse netminder. 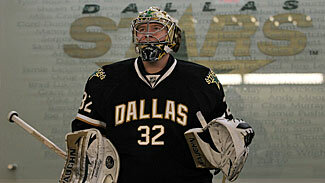 "He's more capable of doing that now," Crawford told the Stars' website about Lehtonen's durability. "Even when he wasn't in the best condition he played a lot of games. Now he's much more conditioned." Crawford had a hand in that conditioning, as he sent goalie coach Mike Valley to work with Lehtonen at home over the summer. "He got in better shape because we pushed him, but he also took responsibility," Crawford said. "To me, the real catalyst for him was the back injury. That's the worst injury to rehabilitate, and he had to do things better to keep his back in good condition. Now he's recognized that he has a great opportunity, and maturity-wise he's ready for it. When you see him and Mike, they are like two peas in a pod." Lehtonen said his physical condition isn't a concern for him -- it's staying sharp mentally while playing every night. "I think the hardest part is getting the mindset right," he told the team's website. "As a goalie you have to be sharp for 60 minutes in case something happens. It's something that you have to learn and something that I'm trying to focus on. That's the key if you want to play well when you play a lot. "You have to train your mind. It's different if it's a game day or off day. On an off day you try and get your mind out of hockey so when the game day comes its easier to get excited again and get going. I spend time with my family to get away from it. It's hard to get excited about a game if you're in hockey mode all the time." Lehtonen's strong play has given his teammates the confidence to make plays and know their goaltender will back them up. "Last year we got a taste of his potential, and this year he's just been tremendous," defenseman Matt Niskanen told the team's website. "He competes on every puck and is fundamentally sound. You don't have to worry when you have a goalie that is playing really solid behind you. The whole team has confidence in him, and he's given the whole team confidence to do what we need to do with the puck. We don't have to be nervous." Lehtonen said he's no longer nervous. He was drafted by the Thrashers with the second pick of the 2002 Entry Draft, and prior to last season only knew that organization. After using last season to acclimate to a new team, Lehtonen is in his own comfort zone in Dallas. "Last year I was really trying to find myself, but this year Dallas feels like home, and the team feels like my team," he said. "It's good. You have to be comfortable off the ice in order to be comfortable on the ice."